American Herds: Gold In Them Thar Hills! The BLM will be preparing a Draft Environmental Impact Statement (DEIS) for what they are calling, The Three Bar Ecosystem, a 750,000 acre project area that aims to restore the landscape from its current “degraded” conditions. The project is now in the scoping phase, where BLM asks the public what issues they want to see BLM address in the DEIS. The main thrust of the proposal is about hazardous fuels reduction, meaning they are targeting the removal of pinion juniper trees and clearing hazardous fuels throughout the area, but that’s not the only action on the table. Other areas they are looking into include improving habitat for mule deer, pronghorn antelope and sage grouse, a big push to protect streams currently occupied by the Threatened Lahontan Cutthroat Trout and adding two more new streams (big ones!) to stock them in, the Henderson and Vinini. There’s also a lot of concern for protecting wildlife species, issues surrounding the preservation of the Pony Express Trail, a great deal of focus on riparian area protection (riparian areas are natural water sources such as streams and seeps), and a general, all across-the-board confession about the loss of plant health and diversity throughout the area. The idea sounds good on paper and who knows, it might be, but there is a suspiciously high level of interest in the management of wild horses with lots of discussion about their contribution to the degraded resources with an equally suspicious LACK of discussion about livestock grazing in the area or what BLM intends to do, if anything, about that. The BLM doesn’t actually provide a list of the livestock allotments that comprise the “Twelve” but from the map provided, it appears the key players in the grazing department, in order of significance, are: Roberts Mountain, JD, Three Bars, Santa Fe Ferguson, Flynn/Praman, Grass Valley, Romano, Lucky C, Dry Creek, Shannon Station, North Diamond, and Underwood allotments. Obviously, not all the allotments are entirely in the proposal area (some of them appear to have very little overlap), but it doesn’t take a rocket scientist to figure out, if the range is being cited as degraded inside the Three Bar Ecosystem boundaries, they are probably equally degraded on the other side of the imaginary line. All combined, BLM has authorized a total of 67,006 AUMs for livestock grazing just between eleven of these twelve allotments. Click Here for a complete breakdown of the grazing authorizations for these allotments. For comparison value, the HMAs involved have an established AML range of 256-327 wild horses equating to a forage allocation low of 3,072 AUMs and a high of 3,924 AUMs. In January 2008, BLM wild horse round ups were conducted in Roberts Mountain and Whistler Mountain HMAs, where 348 wild horses were removed while in January 2009, 80 were removed from the Rocky Hills HMA through the Callaghan Complex round up. In the Callaghan Complex EA(1) , BLM stated that the JD and Grass Valley Allotments had issued new grazing rotation plans, “to reduce or eliminate hot season use of riparian and wetland areas in many of these allotments in order to make progress”. Well, reading through the season of use BLM authorized in the Grass Valley and JD allotments, it doesn’t look like livestock was reduced or eliminated during hot season grazing after all. In the Grass Valley Allotment, there is 1,047 head of cattle run between March 1 and November 30, 349 cattle run between April 1 and January 31, another 370 cattle run between May 1 and January 5, 146 cattle run between July 1 and January 31 and 244 cattle run between June 1 and August 15. In the JD Allotment, which according to the Callaghan EA contains the majority of water for the Rocky Hills HMA, BLM allows 872 cattle to graze the area starting May 1 and continuing on through January 31 every year. **The Romano Allotment active preference received an increase of 825 AUMs in September 2008. This allotment overlaps the Whistler Mountain HMA, where the established AML is 14-24 wild horses. If that 825 AUMs had been given to wild horses instead, 68 horses could have been added to the AML and maybe they could have had a shot at being a remotely viable population. **As of 2008, the Roberts Mountain and Three Bars Allotments had not been assessed for Rangeland Health conformance and these two allotments are sitting smack dab in the middle of the whole project. **As part of the Three Bar Ecosystem proposal, BLM states they are going to perform rangeland health monitoring for the Three Bars, JD, Flynn/Parman, Romano and Lucky C Allotments between October 2009 and July 2010. 2) With all BLM’s talk about “hot season grazing” and “drought”, they aren’t going to collect any data during the two hottest, driest months of the year – August and September – in any of the allotments! 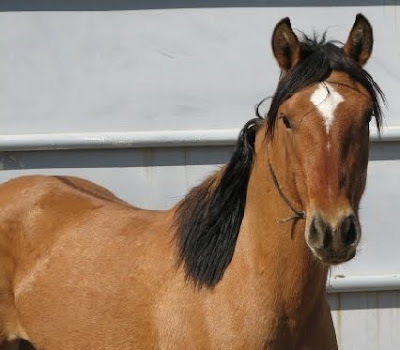 What makes this EXTRA suspect is, BLM also announces in the Three Bar Ecosystem proposal they intend to evaluate and potentially reset the wild horse AMLs for the Robert’s Mountain HMA! There are some other serious problems I suspect the wild horses are about to face during the “planning process” besides BLMs conspicuous lack of data regarding the livestock grazing going on in the area. The first major concern is the Three Bar Ecosystem’s prominent focus of the Lahontan Cutthroat Trout. Last time wild horses faced a planning process that involved protecting the LCT, an Amendment was created to the Elko land use plan that only involved wild horses and the restructuring of the Herd Areas into smaller Herd Management Areas. In 2003, with only three months between start and finish of the bureaucratic process, the Little Humboldt Herd Area was slashed from 63,937 acres to 17,151 acres while the Rock Creek Herd Area went from 183,496 acres to a modest 126,753 acres. In case anyone was wondering who signed that decision, it was current BLM Director Bob Abbey. The other highly contentious issue that is receiving little attention in this scoping document is mining exploration and operations are dominating the landscape, both inside and outside the project area. But that isn’t the only mining operations occurring smack dab in the middle of the Three Bar Ecosystem. While the Mt. Hope Mine is potentially going to gobble up land and water in Roberts and Whistler Mt., the Tonkins Springs Mine in the Rocky Hills HMA may be next. The Tonkin Springs mine, which had not been operational since 1990, became the site of new, intensive exploration efforts thanks to US Gold’s aggressive acquisitions by CEO Rob McEwen. By the way, Mr. McEwen is a busy man. Not only is he the Chairman and CEO of US Gold, he holds the same title for Lexam Energy Explorations, currently involved in a nasty lawsuit regarding their Baca Oil and Gas Project located along the Rocky Mountains in Secretary Salazar’s home state of Colorado. According to the Creston Eagle, US Fish & Wildlife Service (USFWS) didn’t feel seismic blasting, road construction, work crews, water testing and 14,000 ft. depth drilling in the Baca National Wildlife Refuge required an environmental impact statement. Instead, USFWS gave Lexam two thumbs up to carry forward with merely an EA. A federal judge didn’t agree and granted a preliminary injunction in September 2009, an injunction Lexam described as “disappointing” in this September 4, 2009 press release. Lexam is also involved in a uranium mine project in northern Quebec (think nuclear “renewables”) as well as recently acquiring 27% of Canada’s VG Gold Corporation outstanding shares and 42% of their diluted shares. For now, here is what the Three Bar Ecosystem Scoping Summary has to say about wild horse management being planned in this preliminary phase. *Production of the dominant and/or native perennial grass and forb components on all range sites achieves a minimum of 50% of the range site potential. *Plant species frequency, production, and composition indicate an upward trend at range sites where the dominant and/or co-dominant species are missing. *Whistler Mountain HMA wild horse population maintained below the established AML range of 14 to 24 wild horses. *Fish Creek HMA (north) wild horse population maintained below the established AML range of 6 to 10 wild horses. *Rocky Hills HMA wild horse population maintained below the established AML range of 86 to143 wild horses. *Roberts Mountain HMA wild horse population maintained below the current established AML of 150 horses. It is desirable for a range of AML to be established for this HMA to indicate a low population and high population. The estimated range based on existing knowledge/data is 90 to 150 wild horses. *Wild horse populations maintain average body condition scores of 5 or higher on a year-round basis. *No occurrence of the need to conduct emergency gathers or to haul water to HMAs. *All unnecessary fences are completely removed within the 3-Bars ecosystem. With respect to the "desired results" of keeping wild horse population BELOW the existing range of AML's, it is currently unclear if this was an editing error or if this is indeed what the BLM is shooting for. However, since written documents carry the bulk of the legal weight, I intend on responding as if they meant this to be a fact until I see it changed in writing. 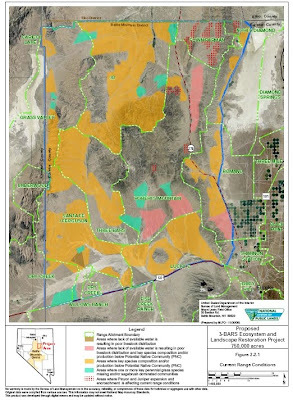 BLM hasn’t posted a copy of this proposal on their Battle Mountain website but a blurry version is available HERE and I have also uploaded the copy I received via snail mail you can access HERE. There also seems to be some confusion about the actual comment deadline. On the Battle Mountain Homepage, under Federal Register Notices, BLM states the comment deadline is February 24, 2010. The first link provided above stated the comment deadline was February 25, 2010. The letter I received via snail mail states the comment deadline was March 1, 2010 4:30 p.m. pst while the “official” Federal Register Notice states that, “all comments must be received prior to the close of the scoping period or 15 days after the last public meeting, whichever is later”. So which one is right? February 24th, February 25th, March 1st or March 11th? And if it’s March 11th, will BLM only accept comments from those who attended the meetings as stated in their News Release or will they accept all public comments as stated in the Federal Register? While again leaving the public dazed and confused as to how and when they can participate, here is the contact information anyway. Also, if you choose to become involved, you must specifically state you would like to stay on their mailing list about this proposal. Contact people: Donavan Walker or Dave Davis. Downloaded from BLMs Internet Adoption Website on 12/09/08. (1) Callaghan Complex Wild Horse Gather, EA# NV062-EA08-134. WOW! Thanks for all the new information. I haven't written a letter in a week but I'm fired up now. The YouTube info spot is incredible. I will be praying more people will care and take action. God Bless your efforts and I will be praying for all our beautiful horses.